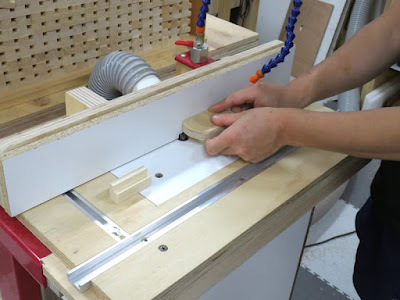 Today's topic is a router table that is one of the important tools for woodworking. A router is a power tool used to hollow out an area in the face of a workpiece. 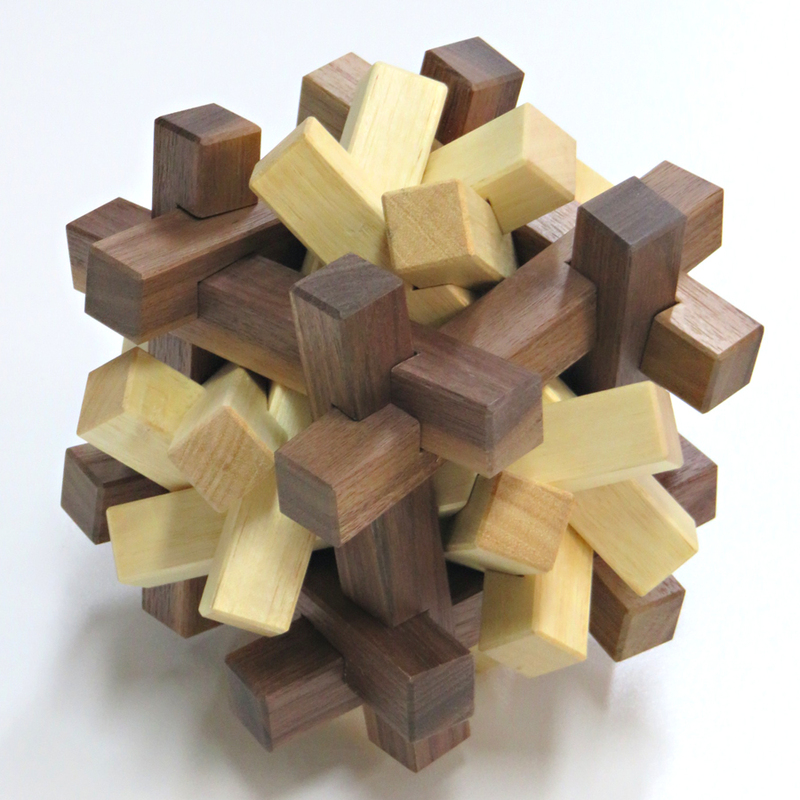 We mainly use the router for rounding the edges of puzzle pieces. Juno bought a router table from a local hardware shop. It seemed all right but once he used it, he noticed that the router couldn't attain precision. 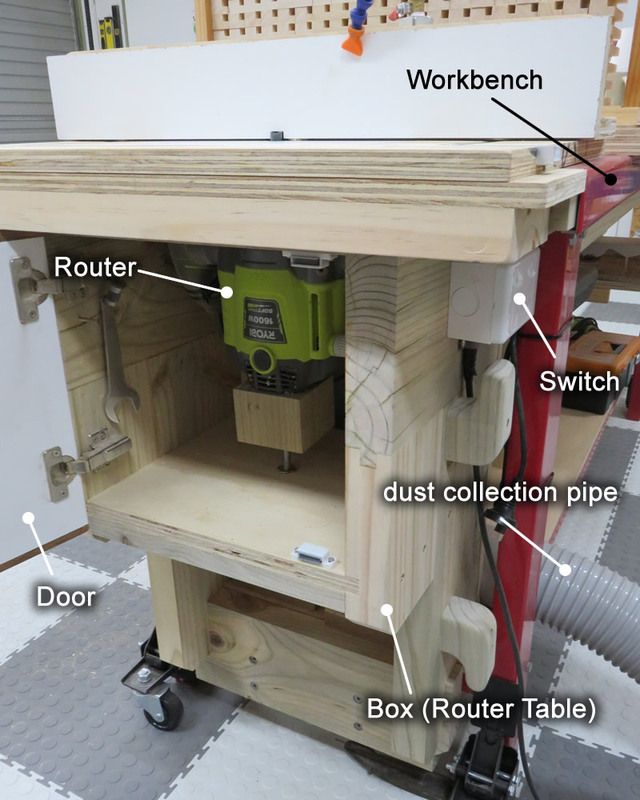 He wanted to increase the precision and decided to make a router table by himself. 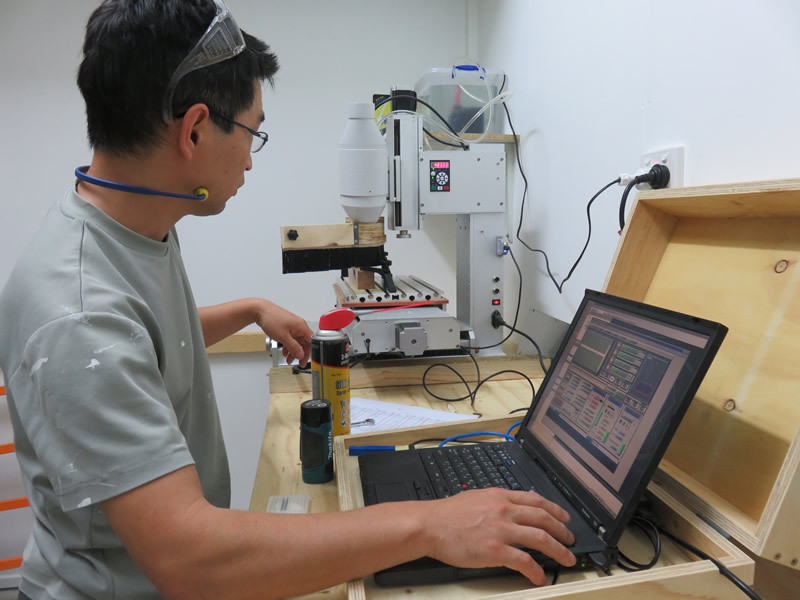 Firstly, Juno made a box and attached it at the end of the workbench (The red legs are the workbench in the picture below). This box will be the base of the router table. Juno bought a cheap router and attached it to the inside of the box upside down. 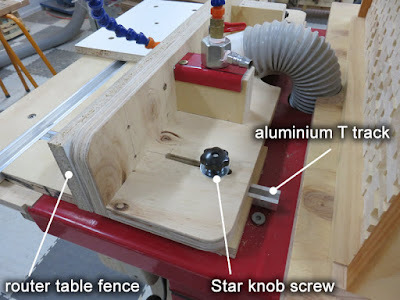 Underneath the box, there is a star knob screw. This screw is connected to the wooden block that is placed in the box. 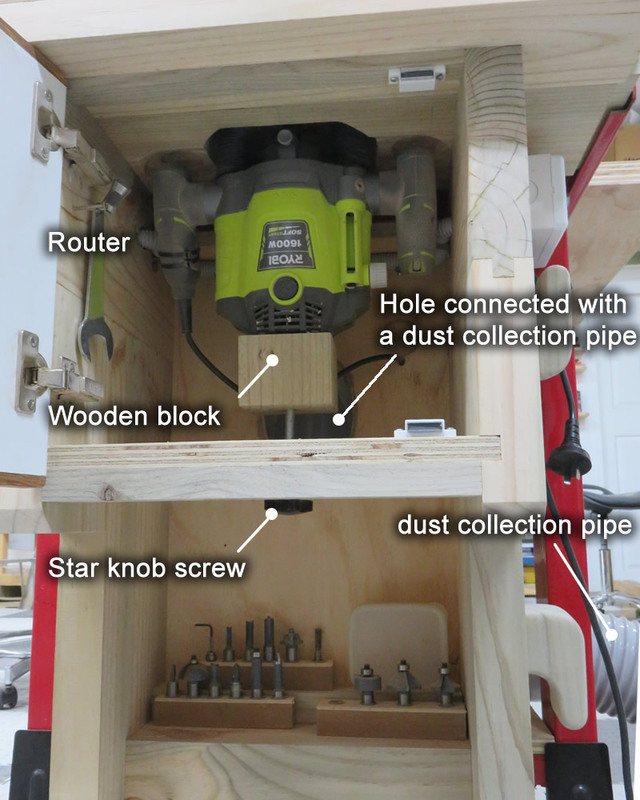 The wooden block is holding the router and it can change the height of a router bit by rotating the star knob screw. 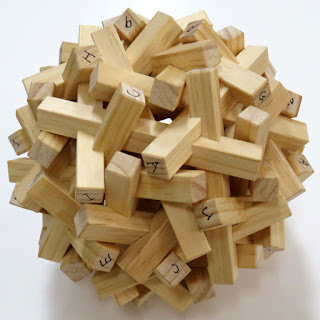 Behind the wooden block, there is a hole which is connected with a dust collection pipe. This dust collection system works really well, we won't be bothered by saw dust. On the workspace of the router table, there is another tool to get rid of sawdust, it's an air assist. 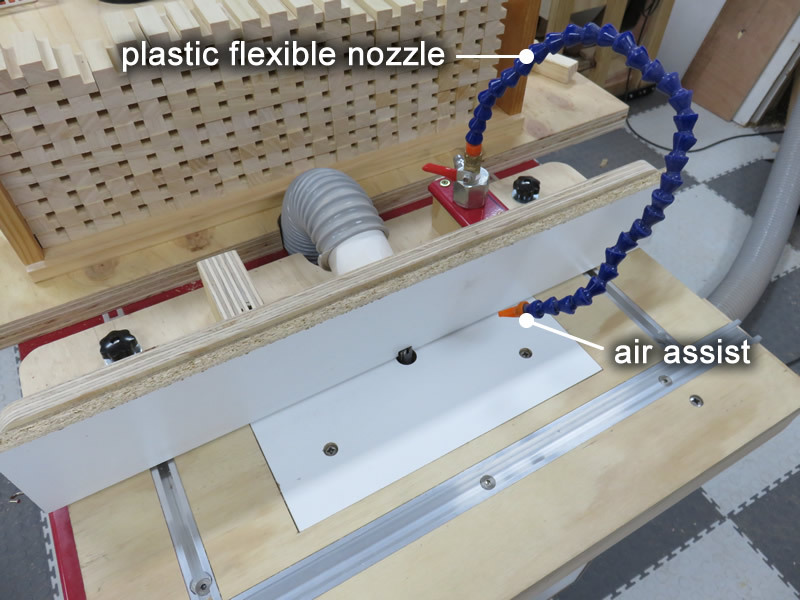 The air assist is connected to the air compressor. We use this plastic flexible nozzle which is very convenient. We use various types of router bits and depending on a bit, we change the board on the router table. Depending on work contents, we need to change the position of the fence, therefore Juno set two aluminum T tracks and two star knob screws on the table. It's easy to use and stable. 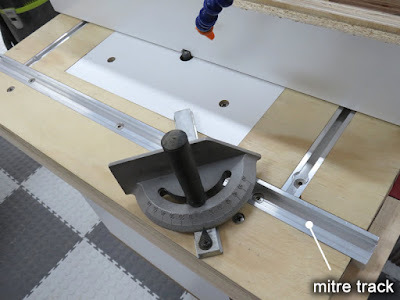 The long mitre track on the router table is for mitre gauges. The last article is about the switch of the router. As you see, the router is inside the box and the box has a door. It is awkward to open and close the door when we use the router. 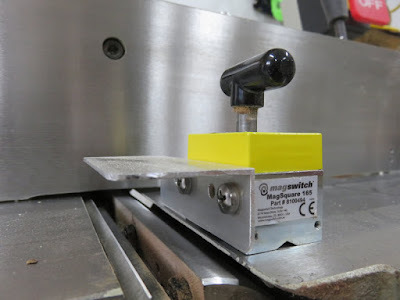 For this reason, Juno uses the power outlet on the workbench as an on-off switch. Preparing a good environment is key to making good products, we believe. Before we start the woodworking, there are plenty of jobs to do, aren't there? I'm going to write about one of the safety measures of our workplace today. We make wooden puzzles and have some machines that have to be used carefully. This machine makes one side of timber flat and also makes 90 degrees of a corner of timber. It is one of the important procedures of sawmilling. 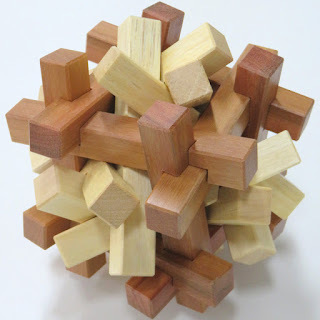 If you cannot make timber really flat or 90 degrees cutting accurately, the pieces of puzzle would be uneven shapes. 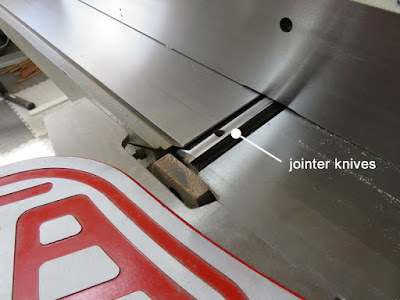 This picture shown below is the jointer knives. 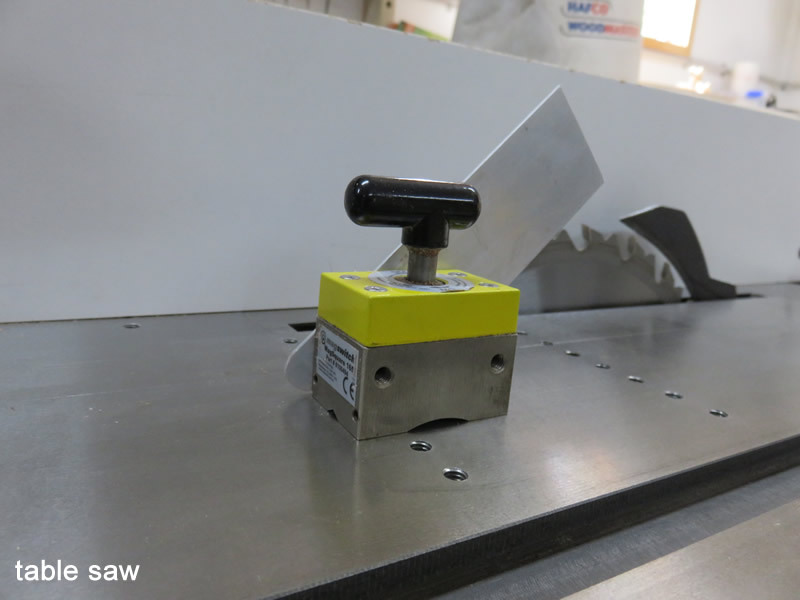 These knives rotate with a high speed, and level the timber surface. 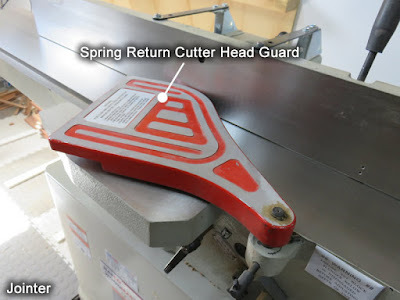 As you can imagine, this part is very dangerous therefore the jointer has a wing shaped part which is called a spring return cutter head guard. This guard can be rotated and is always being pushed on side of the wall of the jointer to cover the knives for safety. However, this guard can be moved easily and there would be a chance to touch the knives. 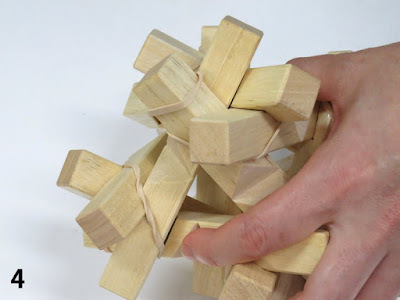 If it happened, that would cause serious injuries to the hand. Better safe than sorry! Juno bought a magnetic tool named "Magswitch" and attached an aluminum angle on the side. Magswitch is a very useful tool, it can be attached easily. When Juno uses the jointer, he measures the timber width and attaches magswitch onto the surface of the jointer with a little wider than width. As you see, the aluminum angle covers the knives. This cover prevent the knives touching accidentally. The last picture is not a jointer, it's a table saw. Table saws are a very dangerous tool. 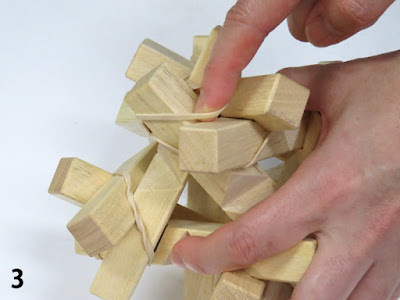 I know several people who lost their fingers. 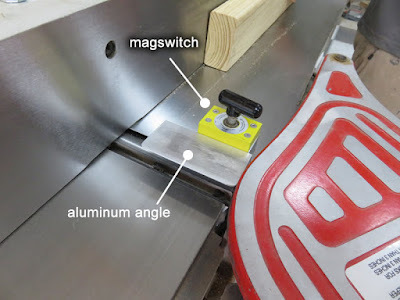 Juno also arranged Magswitch for a table saw. 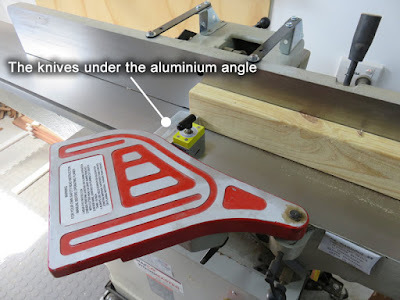 He attached an aluminum angle in a different way. The most important thing is to prevent touching the blades of machines. We human beings are geniuses to make mistakes, aren't we? 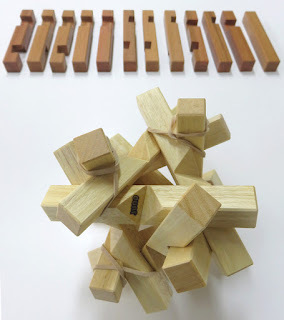 We have started our puzzle business and the first products were released late last month. The products we made were really good but actually one thing was missing, it was a branding mark. We have been thinking that we would like to have a branding iron but at the time we started selling the first puzzle we didn't have one and my husband signed his name instead. 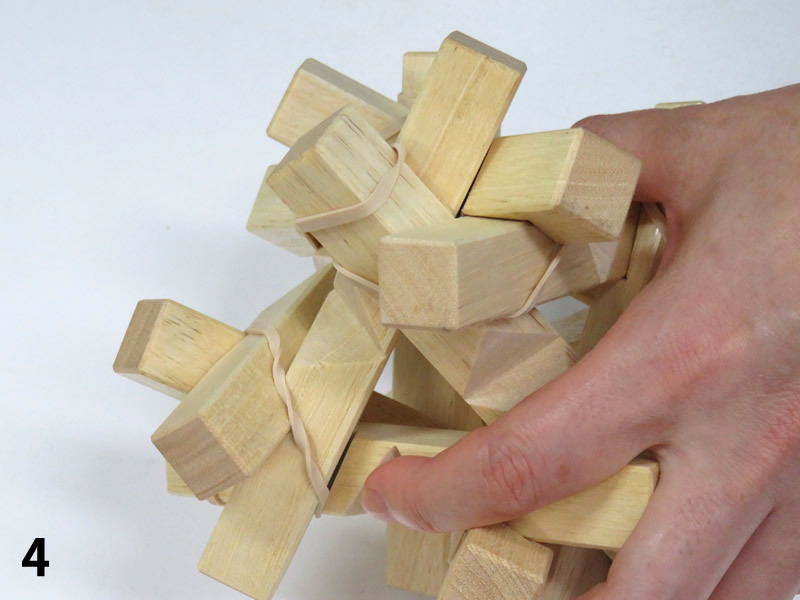 As our customers who bought Reza 6-8 knew, his signature was in a notch of one of the pieces. 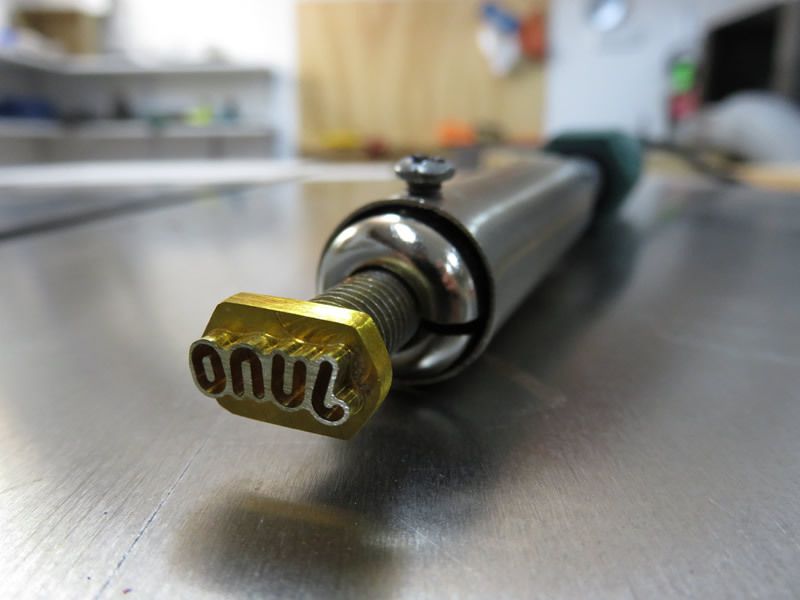 It's easy to order and buy branding irons. 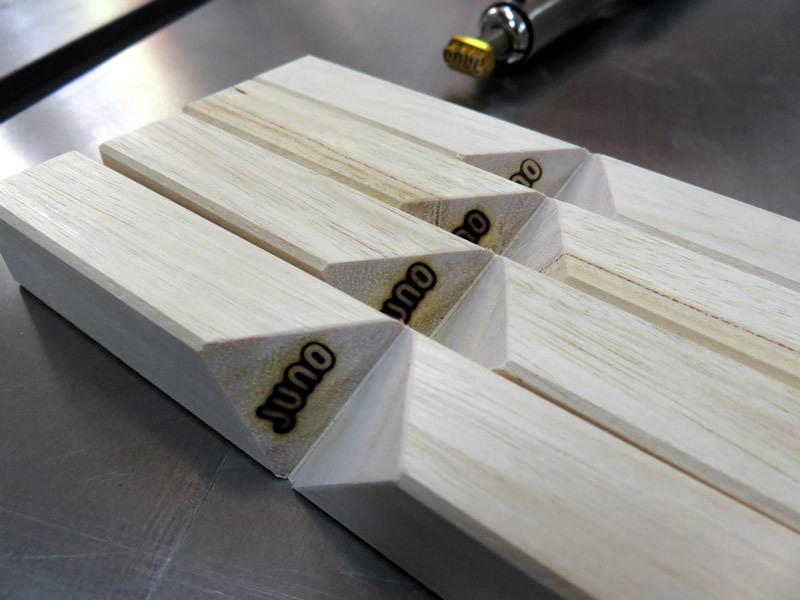 However, Juno had decided to make his branding iron by himself. 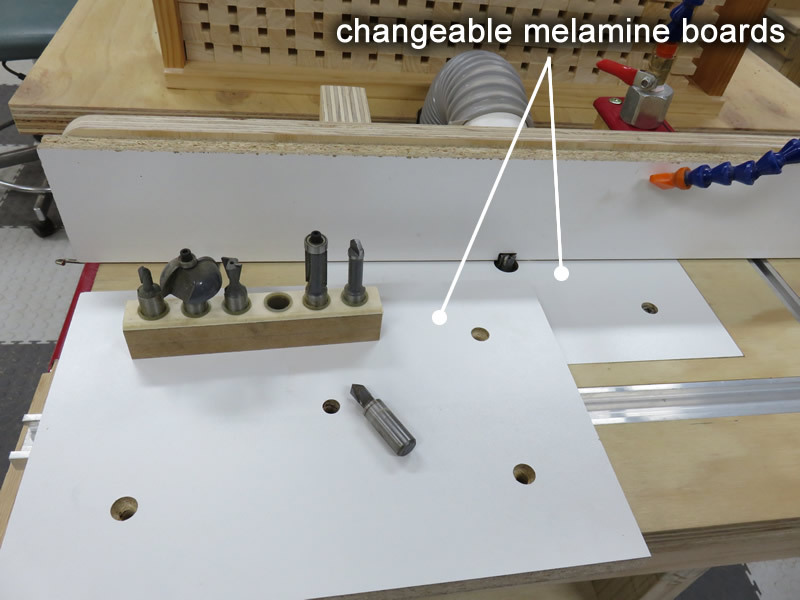 For making a branding iron, he bought brass screws, a 100w soldering torch, and 0.8mm (0.0315in) and 6mm (0.236in) milling bits. Brass screws were for the head of the branding iron. The tool he used was a CNC router and of course a computer that was connected to the CNC router. 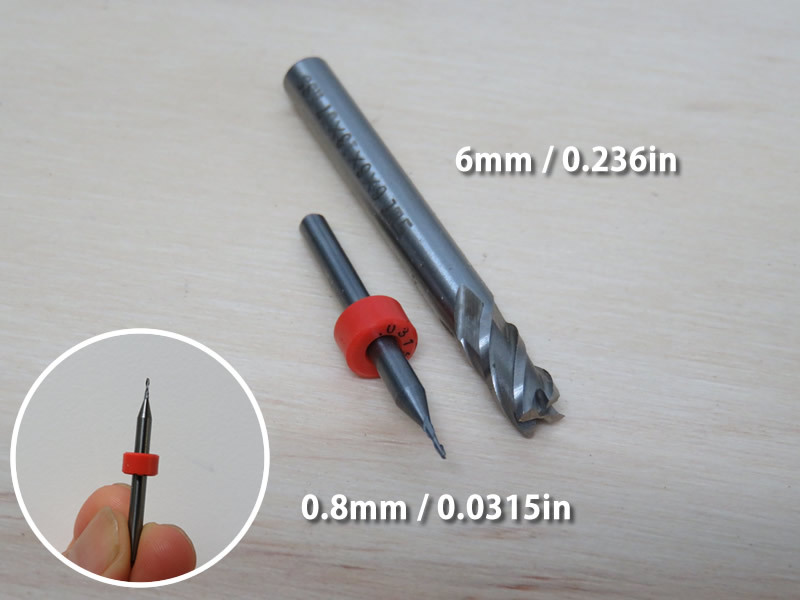 As you can see, one of the milling bits was very thin, it was only 0.8mm (0.0315in). 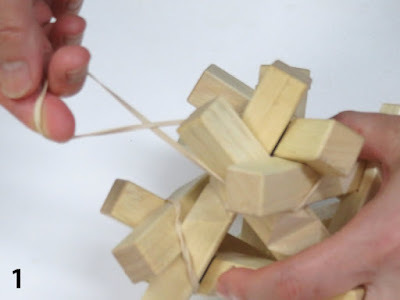 It was scary to use it because it seemed to be broken easily. 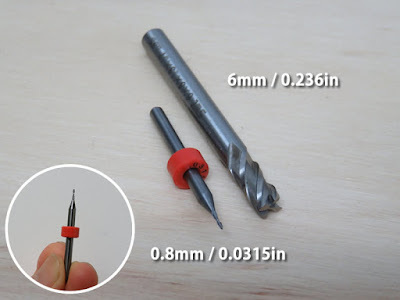 Juno took the bulk of the branding with a 6mm (0.236in) milling bit and curved the detailed lines with a 0.8mm (0.0315in) milling bit. 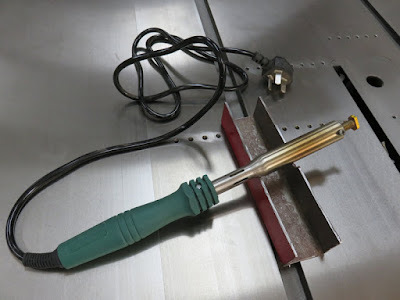 After finishing curving the brass screw, he fitted the brass screw to the soldering torch. Then, the job was done! The next step was testing. It was an exciting moment, you know? Well, the result was very good! These pieces are the first pieces that have got branding iron marks on them. 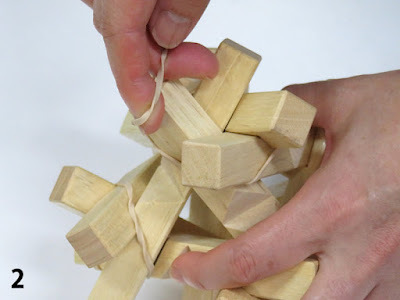 From now on, we will put Juno's mark on puzzle. 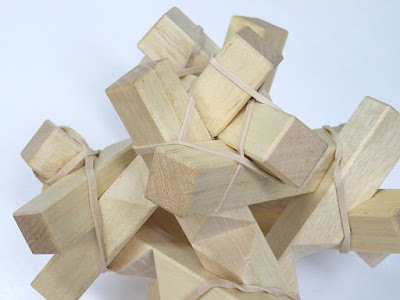 There are plenty of ideas in Juno's head and we will make them as a puzzle in order. I know it's worth waiting! We finally started selling the second puzzle "Reza 12-20" which is the shape of a puzzle based on a compound of dodecahedron and icosahedron. Reza 12-20 is made of Queensland silver ash (white) and Jarrah (dark brown). This puzzle is difficult to solve and also it's difficult to make. The prototype was made of pine and there are many marks on the ends, so it doesn't look good but you can play with this puzzle. We don't think we will use the prototype, therefore we have decided to put it up for eBay auction. 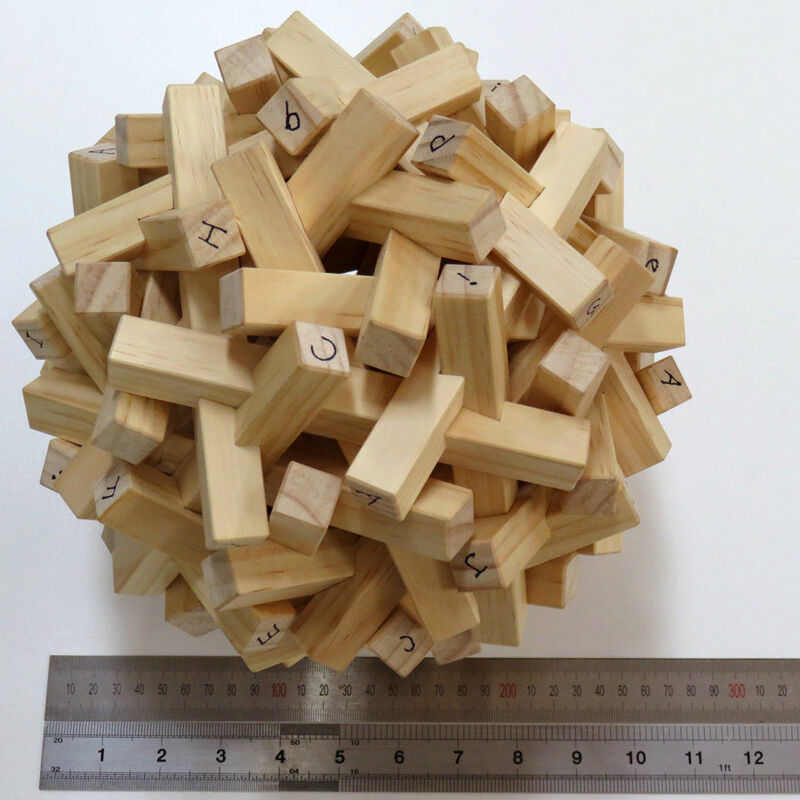 If you would like to play with this puzzle, this would be a good chance to get it. The starting price is AU$1.00 (postage excluded). Please take a look at the page of eBay.